Over the years, as James became more serious about Rollers he joined the NBRC, became more interested in genetics, and consequently started to make many good friendships especially when he traveled to other states like Kentucky, Indiana, and Ohio. James went to National Pigeon Association’s (NPA) Young Bird Show (YBS) in Louisville, Kentucky almost every year. This is where he found most of the color mutations from other pigeon breeds and incorporated them into his own Rollers. Some NBRC guys would also come from all over the US for the YBS, but they would also meet on Friday nights to have discussions about Rollers in general and some NBRC business. James recalls that’s how the NBRC gatherings/conventions started. There were about 30 members of the NBRC at that time. Usually on Saturday morning, they would go to Indiana to watch Joe Marlett and Tony Desaro fly their Rollers. Then on Saturday night, they would travel to Owensboro, Kentucky to watch Carl Hardesty, Larry Hubbard, and Jerry Boehmann’s birds fly on Sunday. 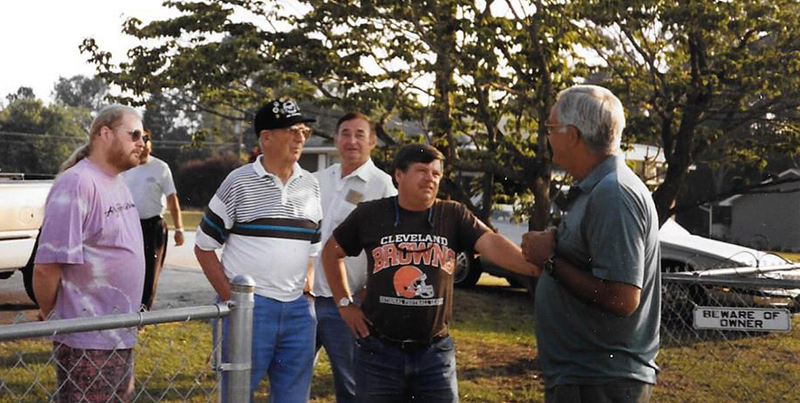 In some summer months, James also visited the pigeon guys in Canton-Akron Ohio, where he met guys like Frank Dallas, Ron Banks, Roger Baker, Wally Fort, and even Joe Quinn. James also visited Roller guys fly birds in Florida and met guys like Frank Serber, Richie Marengo, and Sam Gates. Besides being one of the founding parties of the Foothills Competition Roller Club (FCRC), James has also played a role of starting and then organizing a Roller Pigeon gathering called the Backspin Roller Classic in 1991, which set the stage for convention standard for all others in the nation. According to Bob Simpson, publishing editor of the NBRC Bulletin, there were three major Roller clubs in Carolinas at that time: Carolina Flying Roller Club, Foothills Competition Roller Club, and Piedmont Flying Roller Club. The nucleus of the CFRC were former PFRC members who formed a two-state (NC-SC) competition flying club with 14 flyers, beginning in 1985. Every summer these local SC clubs had a friendly fly/gathering where they had visitors from all over the US, since it was advertised on NBRC bulletins. One year, Jim Schineder came to one of these and recorded the event. He called it the Big Fly in 1989. Until then it was just a fly, where there were no door prizes, raffle tickets, auctions, food, etc. 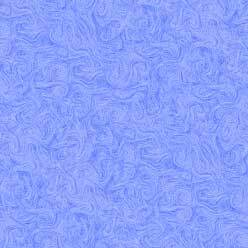 The following year, 1990, they’ve decided to plan and organize a bigger event since there were many visitors and many demands for the Carolina bloodline of Rollers. They named it South Eastern Classic. This was a bigger gathering and it was organized. At that time, each local club had their own bulletins, and surprisingly they had many non-flying members from other states to support these clubs. The information published in these bulletins were so good, some people joined them just to get the bulletins. Bob Simpson edited the CFRC Bulletin while James Turner edited the FCRC Bulletin. Both of the sister clubs had basically the same members. After a year, James wanted to “merge” the two bulletins by sending Simpson FCRC material to incorporate into the CFRC bulletin; his proposal was accepted. The new name of the bulletin and the new name of the fly had an interesting story. Roger Baker and Wally Fort on the left. Bob Welborn and Bob Simpson on the right. The Backspin Roller Classic, in its inaugural meeting, hosted about eighty fanciers from New York to New Mexico. The following year, 1992, it saw over a hundred fanciers in attendance from coast to coast. The event became so famous even the international guests started to show up from Canada, England, and Holland in ’92 and ’93. These international Backspin members consisted of fanciers whom Bob Simpson befriended through written correspondence and telephone calls and who were CFRC members at the time of merger. Both the Foothills Competition Roller Club and the Carolina Flying Roller Club members participated in this exhibition flying convention. According to locals and visitors, it was one of the best Roller Pigeon gatherings of all time. The two sponsoring clubs of the Backspin Classic had decided from the beginning that any profits generated by this mega-event would be given back to those guests who attended, whether it be in the form of food, door prizes, and more importantly, top-of-the-line Carolina bloodline Rollers. Knowing the success of this fly, even the NBRC asked them if they could have their NBRC convention as part of the Backspin Classic in 1995, bringing the total number of attendees to one of the largest Roller events with over 200 fanciers and guests signing to register. 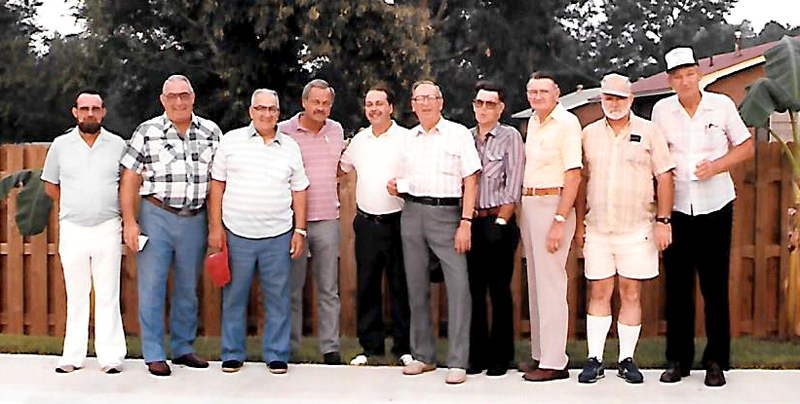 A group picture of an early Backspin Classic at Turner's backyard on the left. Bird auction at Turner's backyard on the right. 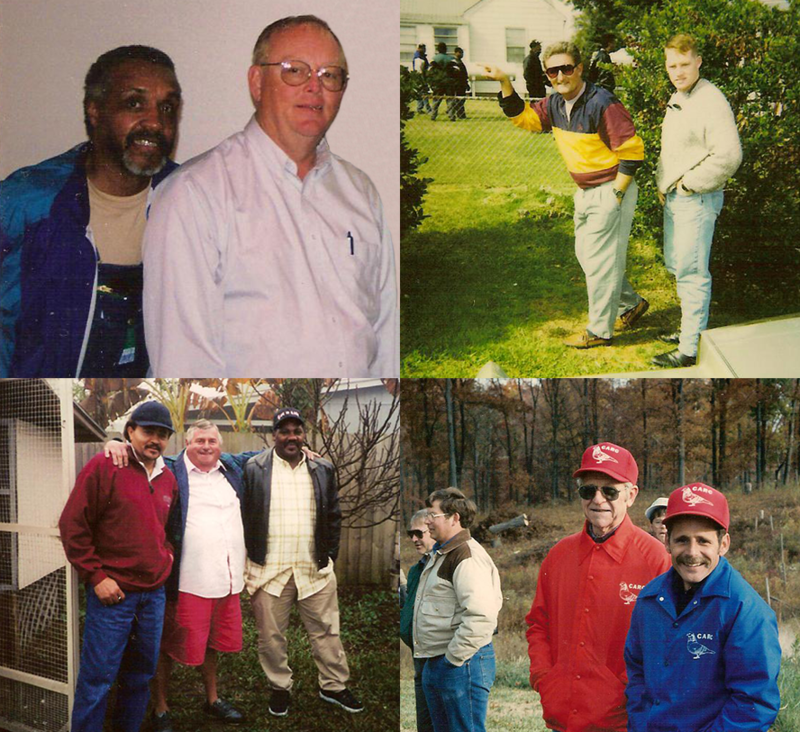 Ron Banks of Akron, Ohio, remembers the great times he had at the Backspin Classic. “I believe it was around 1990, when the guys in South Carolina put out an ad on the bulletin that said they will have a fly, and they would call it the Backspin Classic. Wally Fort, myself, and several other fellas from my area said, “Let’s go see them boys down there.” We had never been to the Carolinas before, so five of us got in Wally Fort’s Thunderbird, and went to John Castro’s house first, then to Tony Roberts’ and James Turner’s house and several other houses like Don Simpson, Don Greene, etc. They all flew fantastic birds. I am never disappointed when I see guys fly Rollers in Carolinas. More importantly, they treated us really well down there. After the fly, they served us catered dinner, gave us prizes, and raffled the pigeons they flew. We had an amazing time visiting South Carolina that year. The following year they had another one, which was just as good with more people visiting. When James and I were talking about the fly after it was over, we discussed that perhaps we should alternate hosting the Backspin Classic. At that time, the Akron-Canton Roller club of Ohio, hosted our own fly and called it the FDB fly, which gets its name from three famous fliers of the area, Wally Fort, Frank Dallas, and Roger Baker. This way, we would all come down to see them one year, and they would come and see us the following year. So we started to alternate, and we really enjoyed those years. I can tell you that in South Carolina, they’ve always treated everyone with great respect and dignity. Especially, James—he has always been very friendly and generous to everyone. We would normally end up in James’s house on a Sunday afternoon at the end of the fly. There would be all kinds of people there, and everyone would want to go home with one of James’s birds. And all they had to do was ask. James would just go down to his kit boxes and reach for the birds that anyone wanted and just hand the birds to them. It was unbelievable that he would give all of his best birds that he just flew in the Backspin to anyone who wanted them. Not only were these birds excellent spinners, but they were also just beautiful to look at. Most people have never seen colors like these that can also spin, and they couldn’t wait to get their hands on one of these birds. I’ve never seen generosity like that anywhere else either. James wanted to make sure visitors left happy from his house. But it almost felt like it made him happier than the guys receiving the birds. I think James gets a special satisfaction when he helps people. He is just that kind of a guy, and I think that’s what makes him really different from anyone else I know. James used to get us private cabins on a lake from his work, just for us to stay in and enjoy our times in South Carolina. 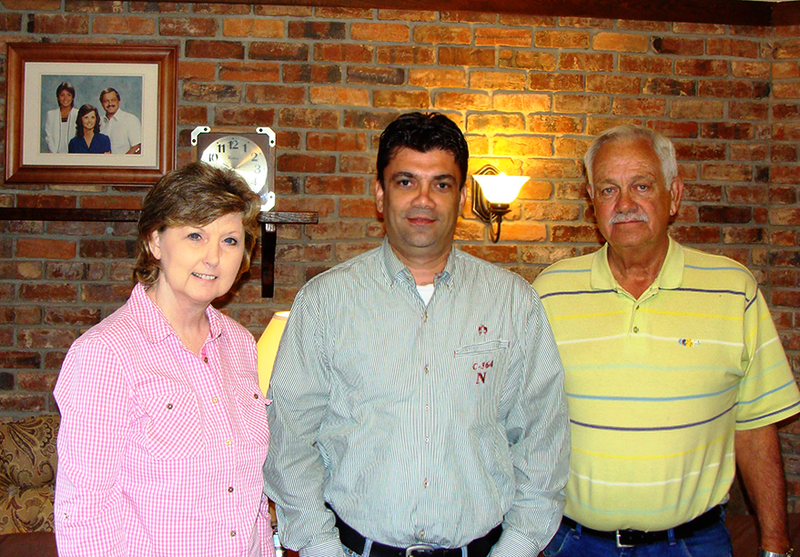 You would experience Southern hospitality at its best when you were the guest of James. At the end of each day, we would all go to the cabins and talk about pigeons. I wish I had a tape recorder back then. Guys like Wally Fort, Carl Hardesty, Tony Roberts, and James Turner would talk, and we would all just listen. They would play a game called “who could tell the biggest lie” about their pigeons. It was just so funny for them to make up stories and see if anyone would believe them. Tony Roberts would say his birds would spin so fast that their feet would get tangled up at the end of the spin. He would just have to untangle their feet for them when they landed. All silly but funny things. 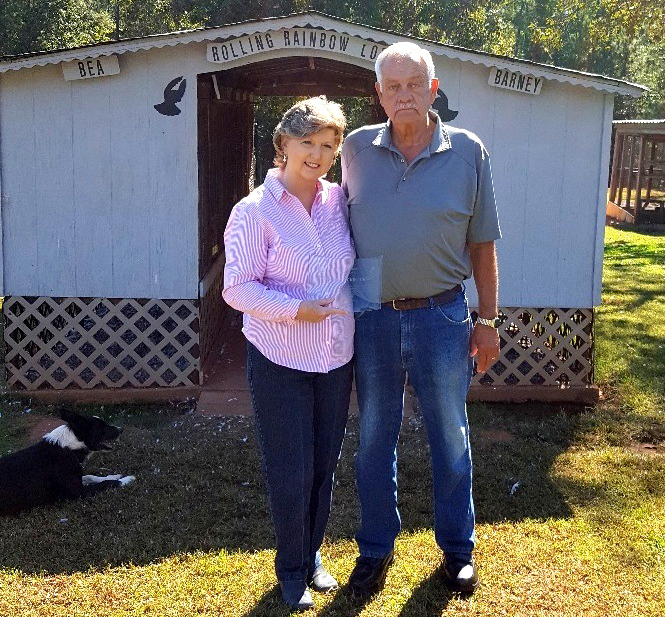 Carl Hardesty would say his birds are so fast, when they rolled down and crashed in his backyard, they would still roll on the ground and make wells for him. Any guy in the business of digging wells should buy some of his birds to save tons of money and time, just using Hardesty Rollers. Some other guys would say he had a roll down once, but this bird would roll sideways. Last time he heard, the bird was over the state of Texas, still rolling…These guys, Arif, they knew how to have fun. They were all full of jokes, but they have never cursed or said anything disrespectful to anyone or about anyone,” recalls Ron Banks. “They have all kinds of raffled items in the Backspin Classic too. I remember one time James and Vickie set me up with a fixed raffle ticket. They were raffling a Rabbit and they read my number. I didn’t want the Rabbit, so I didn’t say a word when they read my number. But when James called me out and said: ‘Ron isn’t that your number?’ I knew they set me up. They called me Ron the Bunny Banks for a long time after that. We just had a great time during the Backspin Classic,” admits Ron Banks. “The Backspin Classic was a lot of preparation, but lots of friends and people would come and watch us fly birds. I have never seen more Roller people in my life the first year I participated in the Backspin Classic. But most people came to meet James and see his birds fly. It was like a modern day NBRC convention, but we had a lot more crowd,” says Larry Williams. A Backspin Classic morning, guys gathering at Turner’s backyard before the fly. “The Backspin Classic was the best thing ever happened around here,” proudly asserts Don Greene. “I loved everything about it; it was the best gathering of bird people on the East Coast. People came from all over the nation to watch our birds fly. Some even came from Canada and England. We would start in a certain location, usually Larry Williams’s or Johnnie’s house from the southern end of the state and finish by my house, which was at the northern end. James and Vickie basically organized and planned everything, including buying the door prizes, ordering food, fly times, hotels, you name it. I was the man in charge of moving people from one location to the other. I was the man that said, ‘OK, it’s time to go.’ I moved the crowd. We had great times hosting the Backspin Classic, and we made sure our guests enjoyed themselves at all costs. I guess it would be an equivalent of a modern-day NBRC convention, except we didn’t have buses and politics. We had given locals and guests different color ribbons to tie it to their cars. If you were a guest, you had a different color ribbon, and you followed one of the locals to find the next house. If you were local, you helped the lost guests to find the next house. It was a very well organized event, people really enjoyed being here,” says Don Greene. J.B. Moffett of Charlotte, North Carolina, recalls the great times he had when he went to the Backspin Classic every year. “They’ve treated us like kings down there. Especially James’s wife, Vickie. She always made sure I was okay, whichever location we went to since I am a disabled man. She always served my meal first before she got some for herself. The guest did not spent a penny from their pockets; everything was free. What was best about the Backspin Classic was that it was a great atmosphere with harmony that we shared with our women and children. Don Greene would warn the guest right off the bat. He would say, ‘From this point on, no drinking and no profanity. We have women and kids around us, where they belong, and we will not tolerate any profanity and drinking during this event.’ I liked that a lot since I never liked profanity,” recalls J.B. Moffett. “And those men flew some outstanding birds. They were absolutely exceptional birds, especially the birds that James flew. They were also beautiful to look at too. People loved James’s birds; everyone wanted one, but to be fair, James would put them in a raffle so that everyone had an equal chance to get one. People always wanted to meet James and listen when he spoke. James, in return, would always be respectful to everyone and always tried to have time for everyone. But, he would never tell them what to do. He would say, ‘This is what would I do, and it works for me.’ He made sure people made their own choices instead of others making the choices for them. 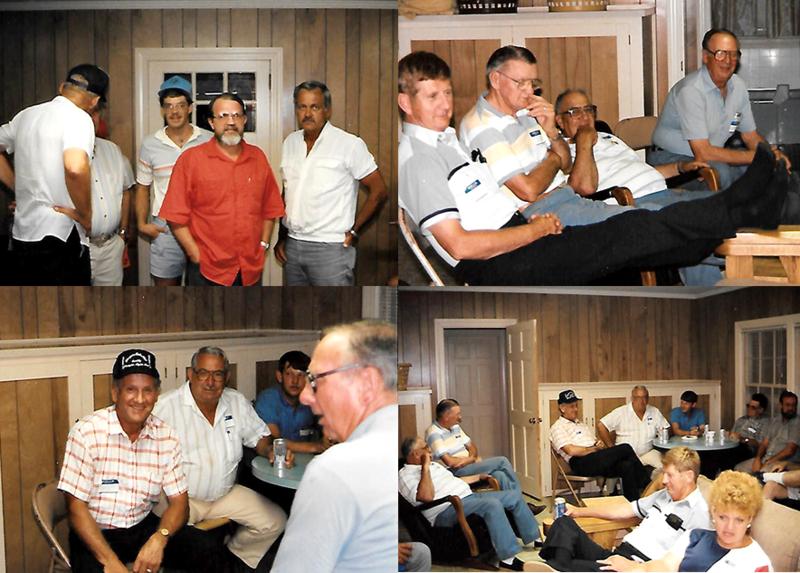 I always enjoyed going down to see guys like James Turner, Tony Roberts, Bob Welborn, Don Greene, and Don Simpson. It was fun to be around good people, and I made a lot of good friends down in South Carolina,” says J.B. Moffett. There is an ol’ saying: Behind every successful man, there is a strong woman. That’s how I would introduce Vickie Turner, beloved wife of James Turner. There is no doubt in my mind that James leaves behind an unprecedented legacy, not only with his flying records and his rainbow-colored pigeons, but also as a champion in his unmatched generosity and, of course, his integrity. Vickie’s similar personality—her happiness and excitement for making new friends through pigeons and her Southern hospitality to make her guests happy at all costs—complemented James such a way that it played a huge role in James’s success. Whenever I plan to visit the house of the Turners, I look forward to seeing Vickie just as much as seeing James and his birds. I am expected to call them when I leave my house in Florida. I have to call them from the road and report how I am doing driving that long nine hours between South Florida and South Carolina. I always receive a huge hug and welcome when I arrive—there is always colder than ice Coors Light beer waiting for me there. When I leave their house, I am again expected to call them from the road, and when I finally arrive at my house, no matter how late it is. “You know mama hen, won’t sleep tonight if she doesn’t hear of your safe arrival,” James would remind me, as he shakes my hand saying goodbye. Vickie’s eyes always gets watery every time she gives me her goodbye hug. Whenever I call James to talk about pigeons and genetics, I can feel the anticipation Vickie has, waiting for James to finish with me so that she could ask me how I am doing. She makes sure to say “I love you” before she hangs up, every single time. James always says without Vickie’s unconditional support and help, he could not have done what he had accomplished in the hobby. Although her knowledge of Rollers surpasses many men in the hobby, Vickie has never raised or flown Rollers. But she was always there when she was needed. She seemed away from the spotlights for most spectators, but she was the support James appreciated the most, especially during rough times when politics and ego got in the way of the hobby he dearly loved. Vickie played an especially big role when she helped her husband with the club activities. She was the brains, the planner, the go-getter of any event that James was in. She made sure everything was planned carefully way ahead of time, designated roles to people in the club, purchased/arranged food, gifts, raffle tickets, hotel reservations—you name it, she did it. She made sure her husband and their club looked good when they had visitors in their neck of the woods. Although every time it felt like James and Vickie were doing most of the work, since most people just wanted to attend an event instead of planning and working during an event, they did it for years and did it better every year. Backspin Classic wasn’t her idea, but she was one of the masterminds behind planning and executing the event. Just like James, it seems Vickie also gets a special satisfaction when she is able to put a smile on people’s faces. “These gatherings with pigeon people weren’t about just the birds,” says Vickie Turner. “There were always women and children around so it was a family affair. People enjoyed being around each other in these gatherings, which was our main goal—to make sure they had a good time. I was one of the few wives that enjoyed the gatherings and was willing to help with organizing the event to make it good and successful,” continues Vickie. “But I don’t want you to give me all the credit,” she quickly adds with her humble way and gentle Southern voice. When asked why she cared if gatherings like Backspin Classic were successful or not, she responded: “I love James so much, so the main reason for me was to make him happy and proud. But I also really liked being involved and being around pigeon people. There is always work to be done for these events, but the reward is much greater than the work—I always liked seeing people and knowing that they are having a good time around us. This probably won’t make much sense to everybody, but I really enjoy seeing other people happy because that makes me happy. We are from the South, and we are proud of our Southern hospitality. It is just very rewarding for us to see other people happy. I wish you were here back then, Arif. There were just so many, so many, good people who would come here from everywhere. But the only sad part was that we only got to see them every other year. I have met a lot of people and made a lot of good friends through these events, and that’s what I really liked the most about the Backspin Classic. I always liked pigeon people, even though I never got involved with pigeons. But at the end of each gathering, especially as we got older, we kept saying this was a lot of work. We would say this was the last time we were ever gonna do it. Then, we would miss seeing our friends, and say let’s get them together and do it one more time. And every time we host the Backspin, people showed up from everywhere because they knew we did everything possible for them to have a good time,” proudly proclaims Vickie Turner. “In all fairness, and I cannot say this enough, I’ve got a lot of credit for a lot of things I haven’t done or deserved. If it wasn’t for Vickie, I could not have done any of it. I have the NBRC Hall of Fame award, but Vickie deserves it,” says James. “Without Vickie, we could not have hosted Backspin Classic as well as we did. When it got bigger and better every time we hosted a Backspin Classic, it became even harder but always rewarding at the end. The main problem was food and beverages since we could never predict how many people would show up, so the hot dogs became part of the Backspin Classic tradition. We made sure the visitors did not spend a penny in these events, except if they wanted to buy raffle tickets. There was food when they came on Friday evening, free lunch on Saturday, and catered barbeque dinner on Saturday night. But we sold enough raffle tickets to cover our expenses. Vickie was the treasurer, and we would always make enough money to host it again for the next event. Our number one priority was to make sure our guests enjoyed themselves. I am really proud to be part of the Backspin Classic, and I can say this fly set the stage for NBRC conventions around the country after they saw what we were doing in South Carolina,” says James. “I have donated or given away all of my flyers by the end of any expedition fly or an event, so basically I started with new flyers every year. It came to a point where I had to put all my flyers for the auction or to the raffle to be fair to everybody who wanted them,” proudly continues James. “When the visitors saw the Carolina bloodlines, they couldn’t believe their eyes. We flew some really, really good birds. My birds’ colors made them even more attractive to the visitors who have never seen colors like dominant opal, reduced, andalusian, and other colors. When they went home with my colored birds, there was absolutely no problem in the beginning. They saw that these birds could spin, and everybody wanted to take some home. But I think when they started to win with these birds in their own clubs and their state’s championships, that’s when the color of the birds became an issue for some people,” laughs James. “But everyone who came and saw our birds wanted one. So, we tried to be fair to everyone and made a rule that we were not to give any birds to anyone until all the raffle tickets were drawn. But for those who have been to Backspin Classics before, would say to the newcomers that they don’t need to buy all these tickets. ‘They will give you birds for free at the end,’ they would advise them,” laughs James. So, when people asked me for birds before the auction or the raffle, I would remind them that we need to sell raffle tickets to cover our expenses. But at the end, I really tried helping anyone who wanted my birds,” says James. James is enjoying a conversation with the guys before they travel back home. Every time I visited James, there was a small pigeon-gathering in his backyard. He would just announce that he would be flying his birds on a Saturday morning, and at least 50 people from the east coast states would show up. People would come from Florida, Alabama, Georgia, North Carolina, Maryland, Pennsylvania, Ohio, etc.—just to see James fly a kit or two. In addition to having a chance to talk to James and many other famous Roller guys, the guests also knew they would be welcomed, fed, and have fun in his backyard. The visitors also knew they would have a chance to take some of his most beautiful-looking birds home with them. Being in James’s backyard and looking at his birds is like Christmas morning. James is like the Santa Claus of Roller guys. If you have always wanted to get an exceptional spinner with an exceptional color, you are in the right place, talking to the right person who has them all even if the real Santa gave you coal in your stocking. In the summer of June 2016, I was in James’s backyard again. James, Ron Banks, Ty Coleman and I decided to surprise one of our mutual friends, J.B. Moffett, and present him a trophy for his contributions to the hobby. Only few of us knew J.B. would be getting this award, and we did a good job making J.B. cry with joy. When the award was being presented by Ron Banks, most people, including J.B., thought that Ron was talking about James Turner. Every time Ron would say a nice word about the recipient of this award, J.B. would nod his head and agree with the compliment. Little did he know that Ron was talking about him. I think it was one of J.B.’s best days ever, receiving this award from his dear friends in the hobby while he was among them having a good time as always. But surprises weren’t over yet. When I got that award made for J.B., I also ordered another one for James and Vickie, and only Ron Banks and Ty Coleman knew about this one. I think James was just as surprised as J.B. was when he and Vickie were recognized with this appreciation trophy. Thank you for your ongoing and tireless efforts to promote the Roller Hobby with the warmest and most southern hospitality possible. We will forever feel welcomed, wanted, and loved at your home. Today, James and Vickie Turner still hold on to that Backspin Classic spirit—promoting the hobby and uniting people of all sorts of background. I, for one, consider myself very, very lucky to know them and to be able to visit them nearly every summer while I still can. As long as they are able to host a gathering, I will be there to reunite with my lifelong friends, start new friendships, watch some birds, and most importantly, HAVE FUN! All rights reserved (c) November, 2017 by Arif Mümtaz.